Obituary – Feken, Benjamin John « Perry High School Alumni Association, Inc.
Benjamin “Ben” Feken, 51, was a 1966 Perry High School graduate. He served in the United States Army. Feken worked as a produce manager for Safeway in Alva and Blackwell and at Homeland and Safeway in Perry. He was a member of the First Christian Church, Veterans of Foreign Wars and he loved fishing and car racing. 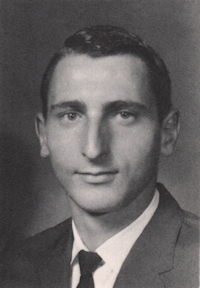 Feken was born July 14, 1947 in Enid to Edward John and Laura Pearl (Gray) Feken. He died at 7:05 a.m. Wednesday, May 26, 1999, at 4:00 the Baptist Medical Center in Oklahoma City. Feken was preceded in death by his mother; and one nephew, Eddie C. Feken. He is survived by his father and stepmother, Ed and June Feken, Perry; two brothers and sisters-in-law, Eddie and Kathy Feken and Fred and Valerie Feken, both of Perry; a twin brother and sister-in law, Frank and Janet Feken, Stillwater; a sister and brother-in-law, Darlene and Bill Klein, Perry; five nephews; 11 nieces; five great nephews; and eight great nieces. Memorial contributions may be made to Oklahoma Medical Research for heart or lung research.